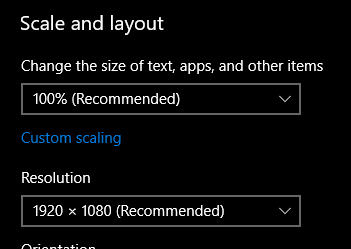 Scaling versus resolution on Windows 10 Display settings? What is the difference between 3840x2160 scaled at 200% and 1920x1080 scaled at 100%? and it is very blurry. Why is this, is there a difference in the DPI? I am running Windows 10 Creators Update (Version 1709). Because it is not the resolution that is scaled, but the relative size of everything. 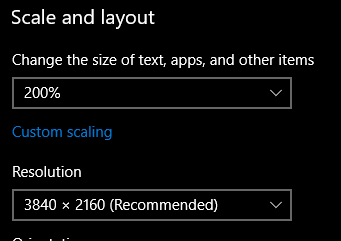 So an app would specify font size 12 but windows would render it at size 24, but at double the dpi (because of the scaling). Not the answer you're looking for? Browse other questions tagged resolution windows-10-v1709 4k-resolution 1080p or ask your own question. How do I change Windows 10 to a resolution for a screen that's not connected?